I was just asked if we had a "You Know You're Addicted to Moonlight when..." thread here and I was surprised to discover that we apparently don't. I do remember seeing this on at least one other site and folks had a lot of fun with it. So, Moonlightaholics -- what was you first clue? Thanks for the thread, Lilly! I've known for a long time that I'm addicted but I had a particular instance today that struck even me. I was listening to a radio broadcast of Christmas stories (http://www.npr.org/templates/story/stor ... d=17488106). Scott Simon was reading one that had a line something like "Joseph was standing apart from Jesus and Mary". What went through my mind upon hearing this in the oldest story in Christiandom? Jason Dohring as Josef, OF COURSE! He was looking an awful lot like when he heard Lola was dead. Speaking of...I was at the movie today, and there was someone in a bit part I recognized as someone who used to be on JAG. My first thought...Jason guest starred on JAG once. Which of course led to thoughts of Josef. You still belong to the best fansites on the planet 2 years down the track.....AND LOVING IT!! Before going to the bathroom???? I yield to your addiction! I can't match you there. Think about Moonlight every day practically. I think when I was on vacation without internet access in the middle of the Pacific Ocean I forgot about Moonlight for a few days. Aside from that, it's been a constant since the day I first sighted Mick. It is truly an addiction, too, because I can never seem to get any work done on my computer because I'm always indulging my ML/Mick obsession. I've burned lots of dinners, too, that I was half-heartedly making whilst talking about Mick, stayed up waaaaay to late making videos or watching the DVD, reading fanfic. I stayed up until 3:30 am making the last video. It is truly an addiction in the strongest form of the word. Sometimes I wish I didn't have it!!!! I have even threatened to unplug the internet from my laptop so I can actually get some work done! The first clue - of many - was the night I called Mr. Phoenix "Mick". He was not amused, to put it mildly. 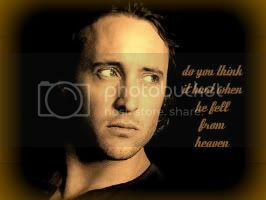 In my defense - coz heaven knows I need one - we were talking on the phone and I had been looking at MickPics at the time Mr. Phoenix called. Possibly the biggest clue to my addiction is that I started a ML messageboard. Yeah, Phee...... that's a pretty good indicator. Says one of the mods...who's on daily. And I know this because--I am, too. whoa!... that definitely beats MLA being the first site you log into after hooking up your brand new 27inch iMac.